Harman has added to its Soundcraft range with a new model and integration with the award-winning UAD plug-ins from Universal Audio. The Si Performer 1 is the most compact Si Performer console to date and features two Option Card slots available for ViSi Connect Expansion cards, 80 inputs to mix, Soundcraft’s patented FaderGlow and Channel Displays for instant mix status, plus the DMX interface and control (which allows simultaneous control of light and sound), all of which is available in a single 19-inch rackmount console. The Si Performer’s two Option Card slots offer unprecedented flexibility, enabling users to connect stageboxes, while providing the ability to connect to audio networks like Dante, BLU Link, and CobraNet. The Option Card slots also allow for use with personal monitoring systems like the dbx PMC Personal Monitor Controller via BLU Link. 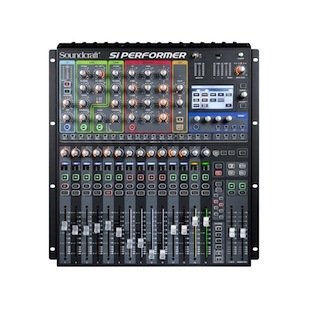 The Si Performer has an input capacity of 80 audio inputs to mix on all models, while featuring the same mix power as the Performer 2 and 3 consoles but with 16 mic pres and 16 faders. It also features fully parametric 4-band EQ as standard on all input channels, and BSS graphic EQs on all bus outputs. This is in addition to the already standard filters, gates, compressors and delays on all inputs and compressors and delays on all outputs, which when calculated delivers the equivalent of over 448 rack units of processing in a tiny footprint. Next, Soundcraft is also debuting the new Soundcraft Realtime Rack – a massive library of award-winning UAD plug-ins from Universal Audio compatible with all Soundcraft Vi Series digital consoles. 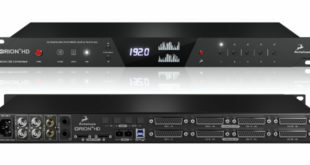 The Realtime Rack is a 1U (one rack unit) enclosure capable of processing up to 16 channels of a MADI stream, while additional units can be added for 32, 48 or 64 channels. Realtime Rack hardware and software allows users of industry-standard Soundcraft Vi consoles to integrate Universal Audio’s UAD Powered Plug-Ins with ultra-low latency and have full snapshot store and recall within the console’s CUE/Snapshot system. There are two versions of the Soundcraft Realtime Rack: the Core comes preloaded with 14 classic HARMAN and UAD plug-ins, while the Ultimate comes fully loaded with 72 plug-ins including emulations of legendary analog hardware from industry-leading brands such as Neve, Studer, Lexicon, Manley, and more. The Realtime Rack software runs on a separate Mac computer and gives the operator all the control needed to insert UAD plug-ins on individual channels, auxiliary channels, and master busses as easily as real hardware. A comprehensive snapshot system allows total recall of all plug-ins and their settings. Tight network integration with Vi Series consoles ensures that all settings of the plug-ins are stored inside a Soundcraft Vi console. One Realtime Rack can run 16 channel strips each with up to eight plug-ins inserted. Realtime Racks can also be daisy-chained to up to four units processing 64 channels simultaneously.